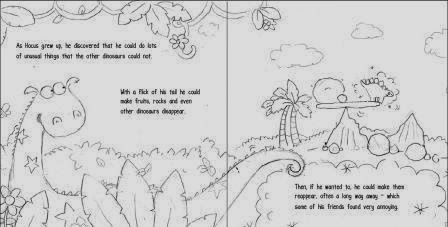 Anyone who has looked into submitting a picture book story for publication will know that publishers really don’t want you to send illustrations with your manuscript. They want to find a great story first, then use their expertise to match it up with an appropriate illustrator. That’s the general advice. It’s hard enough to get your story picked out from the piles of unsolicited manuscripts, without diminishing your chances by insisting that it must be accompanied by your own dodgy artwork. Of course, if you’re an illustrator who has come up with a story idea, then the advice might be different. But, as a writer, this never applied to me. So, having had my story accepted by Maverick Books, I was keen to find out how they would go about finding the right illustrator. Once they had skilfully divided up my story into the appropriate number of spreads for a standard 32-page picture book, Maverick’s approach was to ask a selection of suitable illustrators to produce one full-colour ‘test spread’. The chosen illustrators were given the same spread to work on, from which Maverick chose the favourite. I had heard that some publishers don’t consult the author at all at this stage, but I was delighted that Maverick asked for my opinion from the outset. Clearly, their decision would be final, but it was great for me to be involed. It was a thrilling moment when the test illustrations popped into my inbox. It was fascinating to see how different illustrators had interpreted my characters and how they had chosen to lay out the page. For me, there was one clear favourite, who seemed to have really captured the cheeky, mischievous, slightly naive character of Hocus Pocus that I had in mind when writing the story. Fortunately, Maverick’s preference was the same, and so the very talented Kate Daubney was appointed to illustrate my book. Then Kate went away to produce the full-colour illustrations. Here’s the final version of the above spread. What a work of art! The whole process was a joy to be involved in. It was amazing to see my story brought to life by Kate’s vibrant illustrations, and to see how she had visualised some of the episodes in the story. The final stage was for Kim at Maverick to design the front cover and end-papers, and write the blurb for the back cover. Now the book is complete and ready for printing. It will be out in May 2014. You can even pre-order it on Amazon or Waterstones if the fancy takes you! 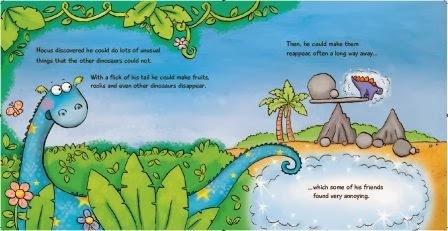 Children's book author and freelance copywriter. 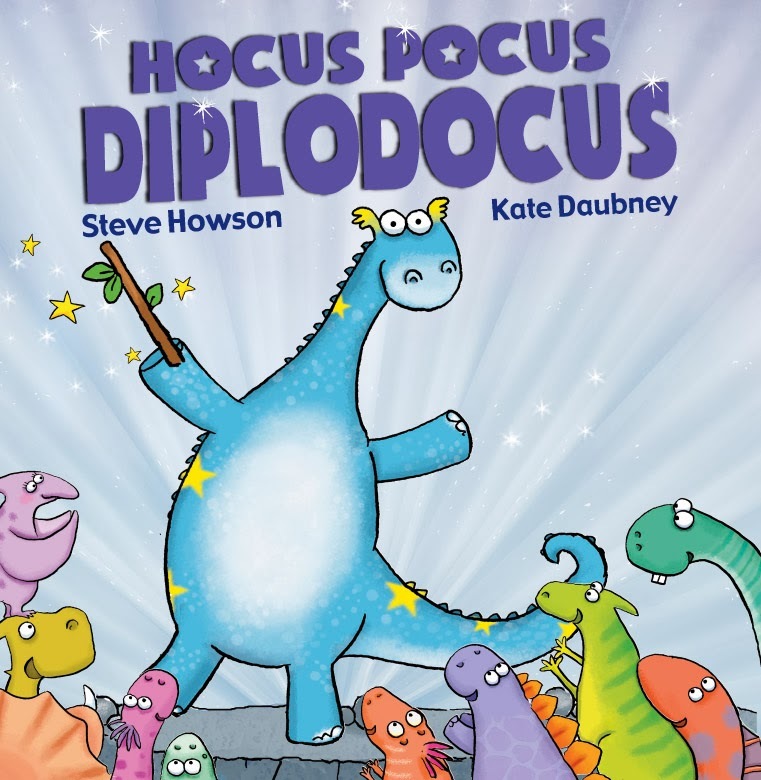 Debut children's picture book, Hocus Pocus Diplodocus, published by Maverick Books in May 2014.